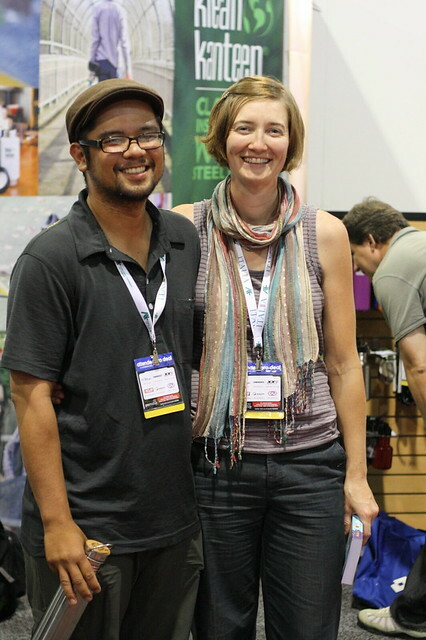 Met up with Russ and Laura at the Klean Kanteen booth. It was great to see them since the last time we had seen each other was a few years ago. But I spent some time with the two of them just asking a ton of questions about their adventures. Though their bike touring life isn’t for everyone, it does sound appealing. To travel by bike all through out the country with just the gear you can pack on your rig is amazing. I asked about how they prepared foods, laundry, showering and I also confessed that I get super jealous when I read about Russ going fly fishing in the middle of the week. Make sure you check out PathlessPedaled.com for more on their adventures. I suspect this duo will end up on the Ellen show because their story is pretty cool!